The Sony Xperia Honami has appeared in a series of live photos again, only this time dressed in a shiny white outfit. 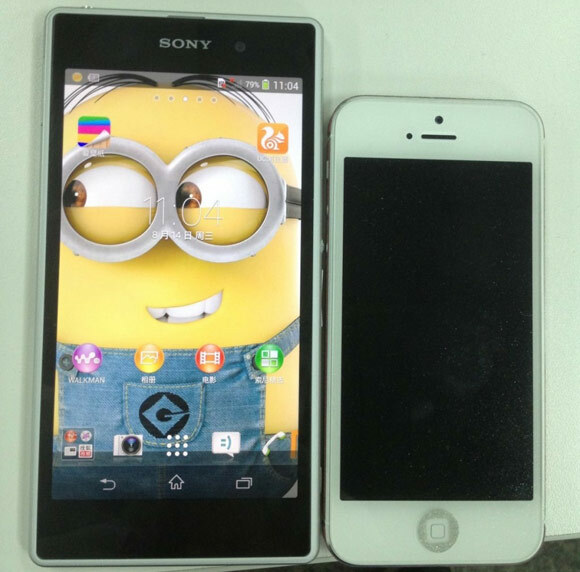 This time around Sony's upcoming cameraphone has also been placed next to an iPhone 5 so we get a better idea of its size. Set to pack a 5" 1080p display, the Xperia Honami won't be much different from the Xperia Z on the front. However, on the back, the Honami will pack a 20.7MP camera, which will be one of its key selling points, along with the Snapdragon 800 chipset inside. The Sony Honami camera is coupled with an LED flash. The sensor packs a size of 1/2.3" and features G Lens, commonly found in the company's point-and-shoot digital cameras. As we already mentioned, under the hood of the Xperia Honami is said to tick the powerful Snapdragon 800 chipset with Adreno 330 GPU and quad-core Krait 400 CPU. It'll run Android 4.2.2 Jelly Bean with Sony's Xperia UI on top. As with many of the Sony high-end smartphones for 2013, the Honami is also expected to be water resistant. Sony has scheduled an event for September 4 in Berlin, where it'll take the wraps off its new flagship cameraphone. Stay tuned, as we'll be covering the event extensively!